There’s been a great buzz around Quoin Rock’s recent revival through renovation. We attended the reopening and it’s clear that fresh life has been breathed into the storied estate through the new owner’s exciting vision. The bronze sculpture of a vine reaching skywards dominates the entrance hallway, its gnarled stem speaking to its deep roots in the soils of the Stellenbosch winelands. And yet the tips are polished, fresh tendrils reaching for the sky, signalling a flush of new growth and of life renewed. 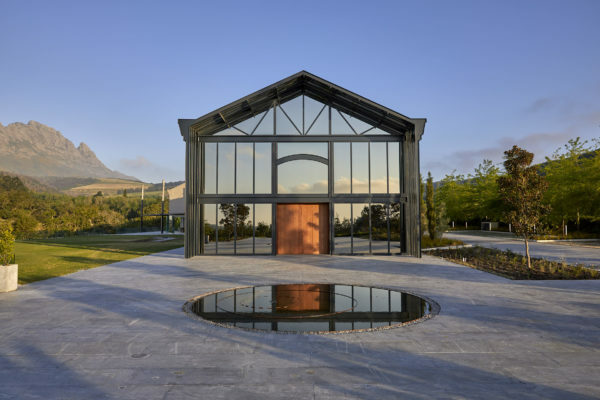 It is the perfect visual metaphor for the dramatic reinvention of Quoin Rock, the family-owned wine estate on the slopes of the Simonsberg that has reopened to the public after six years of careful renovation and restoration. 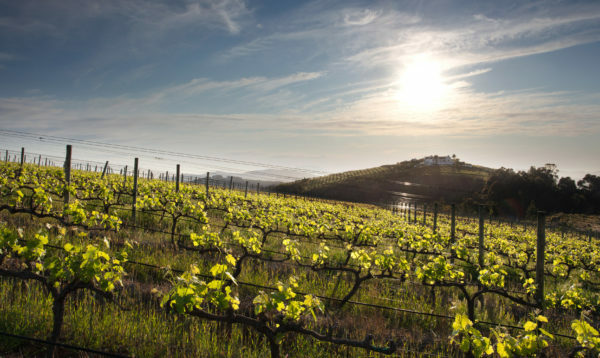 The Gaiduk family purchased Quoin Rock in 2012, after a chance trip to the Cape winelands saw Vitaly Gaiduk fall quickly in love with the scenic landscapes surrounding Stellenbosch. “My father has a true passion for wine, and what really appealed to us about Quoin Rock was the clean canvas and the opportunity to create the vision our family had for the property, and the wine” explains Denis Gaiduk, Managing Director of Quoin Rock. 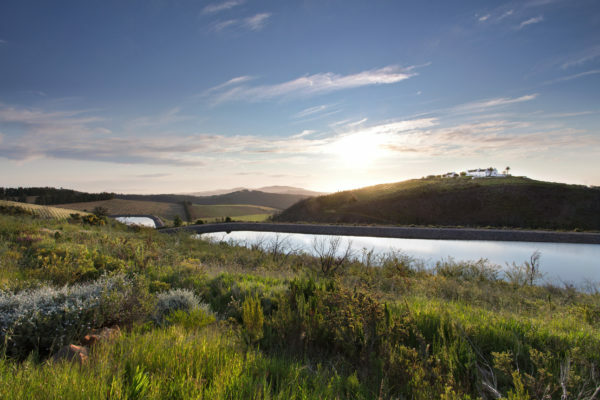 While the previous owners had sorely neglected the vineyards and farm during an extended liquidation process, the family has poured enormous energy into improving the vineyards and estate. 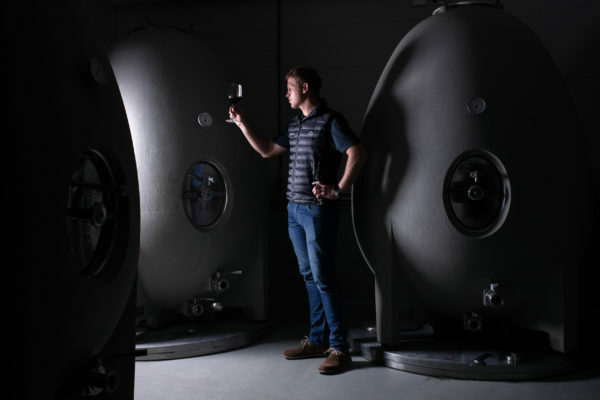 With that philosophy in mind a new winemaking and viticultural team was appointed to oversee the process of rejuvenating and replanting vineyards, alongside modernising the technology in the cellar. Today, 36 hectares of vineyard are spread across the 200-hectare property, ensuring the potential for future expansion. The wines of Quoin Rock are best experienced in the elegant new Wine Lounge, where glass walls offer a glimpse into the atmospheric barrel maturation cellar. 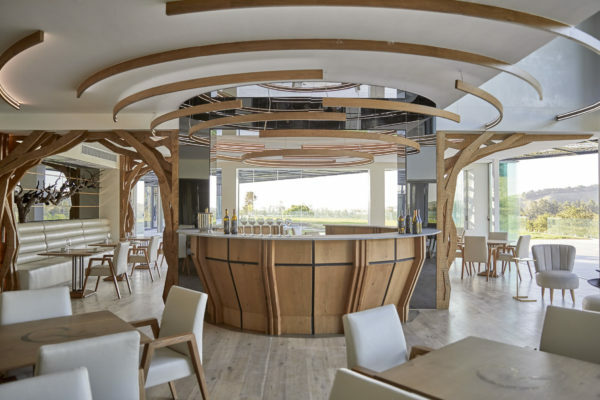 And there’s no shortage of eye-catching detail in the chic new space, where organic elements of wood, stone and water play off against the sleek leather banquettes and striking vineyard views. The central wine bar is fashioned to resemble the fermentation egg shaped vessels in the adjoining cellar, while the ceiling motifs offer a visual link to the movement of the vine leaves in the summer winds. Bespoke tastings are offered at handcrafted tables from Pierre Cronje, using delicate Schott Zwiesel crystal glasses. ­“Everything at Quoin Rock is about quality, and if you’re here to taste the wine it needs to be in a beautiful setting, with excellent glasses,” says Denis Gaiduk. 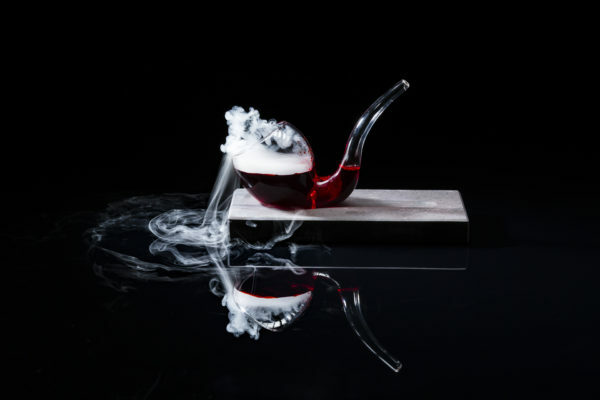 Come evening, the Wine Lounge transforms into one of the most exciting new restaurants to hit the winelands in years. Gåte, Executive Chef Rikku Ò’Donnchü presents an international aesthetic and boundary-breaking cuisine across a 16-course menu that melds tradition and science. “The menu at Gåte is about playing with the senses as much as possible. I don’t want this to be just a meal. It should be a complete experience for all of your senses,” says Ò’Donnchü, who promises everything from hands-on dining and tableside preparation to interactive experiences. A drinks pairing with each course – using both estate wines and Ò’Donnchü’s own creations – is also offered. On balmy evening the tables at Gåte spill out onto a broad terrace shaded by an eye-catching pergola of laser-cut aluminium, the intricate design replicating the dappled shade of vine leaves. “The whole visit to Quoin Rock should be an experience that ties in with the natural beauty of the estate,” adds Julia Gaiduk, who also reimagined the adjoining warehouse space into an airy light-filled events space, capable of welcoming up to 200 guests. Here, brick walls were replaced with soaring panels of glass, allowing panoramic views of the winelands. There are more of those unforgettable views at the Manor House, where the interiors have been entirely overhauled to create a modern country escape surrounded by classical European gardens and indigenous fynbos. The Manor House offers four spacious double en-suite bedrooms, alongside a private honeymoon suite and separate guest cottage. The Manor House is fully serviced, and booked on an exclusive-use basis only. Situated in the midst of some of South Africa’s finest terroir, and with a bold new vision for the future, Quoin Rock is – at last – ready to delight visitors to the winelands. For more info visit: www.quoinrock.co.za or follow @quoinrockwines on Instagram.